Ralph Waldo Emerson once said earth laughs in flower. If that is the case, Singapore is full of laughter. Gardens by the Bay, set in Singapore's Marina Bay downtown area, has been open less than a month, but it's already changing the face of the country. The project, which cost $810 million to build, covers the space of 177 football fields and houses 80 percent of the world's plant species - this is not your mother's garden. Singapore Prime Minister Lee Hsien Loong calls the new garden project "an icon of Marina Bay" and "the latest manifestation of Singapore's Garden City vision." For the 70,000 people who visited the garden within the first two days of its opening it was a sight to be seen. Visitors take in awe-inspiring views, including the world's tallest cooled conservatories, housing some of the most endangered habitats and plants in the world, and a grove of 18 gigantic solar-power, man-made "supertrees" ranging in height from 25 to 50 meters, all designed to collect rainwater. "The idea and feel for the supertrees was in part inspired by the 'Valley of the Giants' in southwest Australia," said Andrew Grant, CEO of Grant Associates, the firm that won an international competition to build the project. "I had visited these amazing trees when I went to see my brother who lives near Perth," he told ABC News. "The striking experience of changing from the normal eucalyptus forest into the super tall worlds of the Karri trees, along with the experience of the elevated walkway was very inspiring. We merged this physical reference with the magical experience of the forest seen in the Studio Ghibli film 'Princess Mononoko' to create the character and scale of the supertree grove." The project is a futuristic take on nature and as well an awe-inspiring vision for the future of a city. Gardens by the Bay is also a marvel of sustainable energy and water usage. An underground biomass boiler system that runs on tree and grass clippings and organic waste has been installed. The boiler system, along with onsite solar-photovoltaics, generate energy to cool the garden's two conservatory domes. Water collection from the supertrees acts as another imaginative irrigation source. But Garden's by the Bay is just the tip of the iceberg for Singapore's green vision. The 272-square-mile city-state has undergone an economic miracle in the last half a century: From 1960 to 2010; the city-state's GDP increased 41-fold, as it became the world's fourth-largest financial center. In the midst of reshaping the economy, the city-state created another miracle by managing to remain a garden nation. Singapore's green efforts began in 1963 when then Prime Minister Lee Kuan Yew initiated a tree-planting campaign that added 1.5 million trees. As a result, Singapore - even though highly urbanized - looks more like a garden than a concrete jungle. Today, the city is still trying to reinvent the country of 5.2 million as "a city within a garden." "Sustainable development is a journey, not a destination," Cheng Hsing Yao, deputy executive director of the Center for Livable Cities in Singapore told ABC News. "No matter how developed you are, there will always be new challenges." All around the nation you can see little signs of gardener's care. Plantings have been installed to soften the look of cement retaining walls, and various green areas throughout the island have been interconnecting with overhead pedestrian bridges. The government is going out of its way to ensure the city remains a place where plants and parks live in harmony with the city. 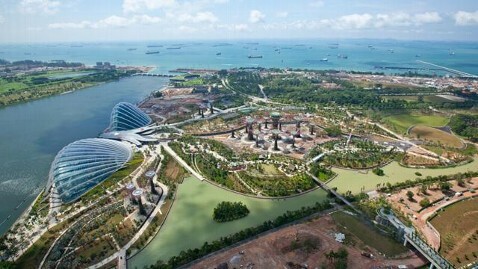 "Gardens by the Bay is one of a number of groundbreaking landscape projects that are shaping the identity of Singapore as a City in a Garden," Grant said. "Others include the Bishan Park, Tampines Eco Park and the round island green corridor. A common thread within these projects is the desire to create attractive and functional outdoor space for the people of Singapore where the cultural and ecological benefits of plants and habitats are emphasized."